The Junior High class helped with the Liturgical Stations activity we did for Catholic Schools week. The Junior High students did the opening. They divided into four groups for the four seasons (summer, spring, fall, and winter). Each season had various props, costumes, and a song to represent the activities of that season. For example, the winter group had a snowboard and the fall group had a rake.This opening helped the younger students understand the concept of the Liturgical seasons. Mrs. Godsil sang a song for each of the six seasons of the Church. Afterwards, the students split into groups by grade, and spent fifteen minutes in six classrooms. Each classroom focused on one of the Liturgical seasons and had activities and a lesson to do. The doors of the classrooms were decorated with the colors of the season the room was teaching about and was decorated to represent it. All grades participated in the Liturgical season stations. 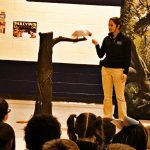 On February first 2017, The Columbus Zoo came to visit St. Mary’s school. With them they brought 9 animals from around the world. This included a snake, two different birds, an owl, 3 different mammals, and two cockroaches. They had two St. Mary’s students volunteer to hold the beetles. 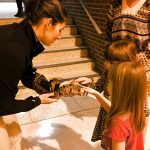 There were two zookeepers, and they were very helpful, and they knew everything about the animals, and taught it to the kids. One of the parrots even knew how to dance! The owl flew through the center aisle over, and over. At the very end they let them pet the snake, Lucy! 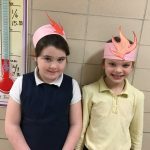 On Thursday of our Catholic Schools Week, all of are students got the chance to wear their pajamas to school. Ditch the uniform, time to get comfy in our PJ’s. Disclaimer: We do not condone sleeping in school. Also on Thursday, St. Mary’s students all participated in a community service project. Our K-4th graders made bird feeders. While they were doing this, our 5-8th graders made blankets for the nursing home next door and one for Father Beaver. Come enjoy this delicious pizza lunch at our St. Mary School’s family luncheon. As a side dish we also have a yummy salad made by the two friendliest lunch ladies in the world, Mrs.Schlupp and Mrs.Storms. After this lunch be sure to meet us all in the gym for some parent v.s student fun in a challenge we like to call Minute to Win It. This will be approximately 20 minutes long.